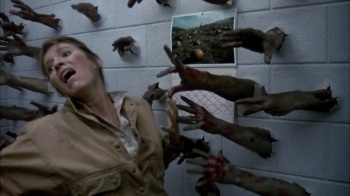 George Romero's Day Of The Dead is a classic of the zombie film genre, so we aren't entirely stunned to see it being remade only five years after the last remake effort. Day of the Dead debuted in 1985 as the second sequel to Romero's classic Night of the Living Dead. Whereas the first film was an allegorical dissection of the horror found in mass group-think, and the second was Romero's screed against rampant consumerism, Day of the Dead warns against the dangers of relying too heavily on the military during times of crisis. In our modern world, where the NSA is spying on everyone and our fighting forces routinely deploy unmanned drones to kill targets from thousands of miles away, it seems an appropriate message. Given Hollywood's propensity for remaking every pop cultural concept created in the 80s, it was no surprise when the film was remade in 2008. That attempt was glossy and arguably entertaining, but it hewed closer to B-movie fare than Romero's chilling original, and is best forgotten. Fortunately, Hollywood studios never know when to say "no" to an idea that's already generated millions of dollars, and thus Day of the Dead is being dragged from its tomb yet again for another remake. According to the LA Times, Lati Grobman and Christa Campbell, two producers most famous for 2013's Texas Chainsaw 3D (itself a remake of a horror classic), have acquired the rights to Day of the Dead and are currently meeting with potential screenwriters to pen a new remake. But why remake this movie again? Why now? Simply put, zombies are hot. "Zombie movies are really popular right now, and we feel we could do this right," states Campbell who actually had a small role in the 2008 Day of the Dead remake before switching full-time to a producer role. Alright, that makes sense, at least fiscally, but what will Campbell and Grobman bring to this new Day of the Dead that might make it worth the cost of admission? How about classic Romero-style zombies? "We want to keep it as close to the Romero version as possible, to make sure that his fans are happy," the producers claim. "These are not going to be zombies climbing walls and doing back flips like in World War Z." Those who have seen the first Day of the Dead remake already know that it ditched the classic, ponderous zombies in favor of corpses capable of sprinting. That kind of thing really sets off old-school zombie aficionados, so it's nice to see that Grobman and Campbell have already decided to avoid that potential pitfall in their remake. Now if only the duo can ensure a pitch-black ending and tons of creative gore - the less CGI, the better - this project might turn into something worthwhile. We'll keep you updated.